A couple weekends ago I was at my local market and a bag of raw olives just jumped into my basket. Besides that, I have really no explanation for how I managed to bring home ten pounds of Sevillano Olives without the faintest idea of what to do with them. But here they were in my kitchen, wrapped in a mesh bag all the way from California, and so after about eight days of that I realized – I have to get going on these before they shrivel and become unusable, and so at the end of last week (right before the start of meditation retreat) I got down to processing them. 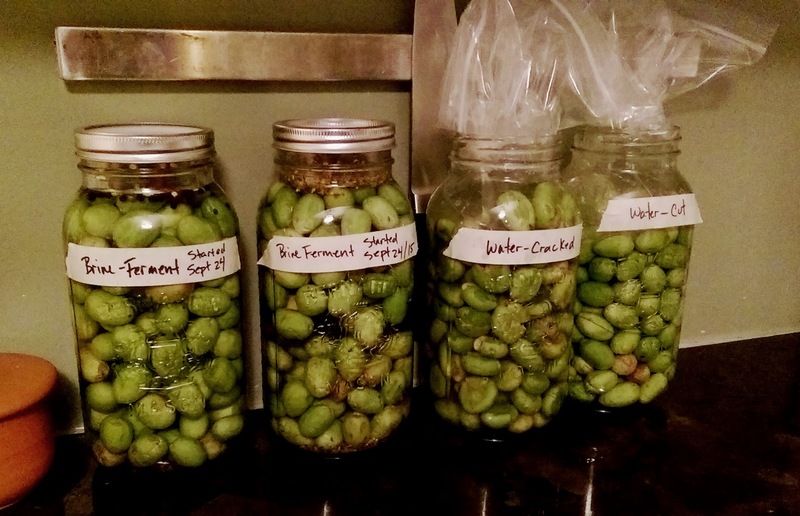 Although I am super-curious about lye-curing olives, I didn’t have any lye on hand, nor did I have time to stop at the Homesteader’s Emporium to get some. Instead, I opted to try them two different ways – Brine Ferment, and Water Cured. Because ten pounds of olives translates into 2 gallons of processed olives, I’ve got two jars of each, and I’ve done each jar differently. The brine-ferment jars are spiced – one with pickling spice, and the other with peppercorns and chilis. I plan to spice the water-cured ones differently as well, but I also processed them in two different ways – cut, and cracked. I figure that since this might be the one and only time I get my hands on raw olives (I’ve never seen them in a store here before) – I might as well experiment and see what turns out the most edible. Anyhow, these definitely require some attention, so I’m leaving them where I can see them.